One of the older projects that we have worked on at the SAL is the Favorite Places Map on our website. 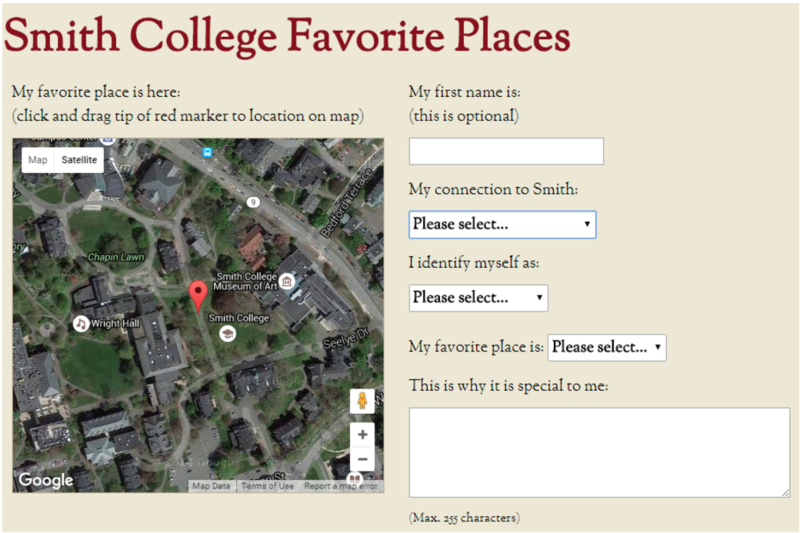 The goal of this project was to see where students, alums, and others saw as their favorite places on campus. Are there parts of campus that students aggregate more towards or are there a well-defined number of population locations on campus? Our map was one way to visualize responses to questions like these. This application was designed to allow users to pick their favorite location as part of a web map display. Users are able to drop and move place-markers to their favorite locations. As seen in the Favorite Places image, the red marker to the left is the object users are able to move to their desired location; the default location is directly on the walkway in front of Neilson Library. After collecting user responses, we noticed an interesting trend. 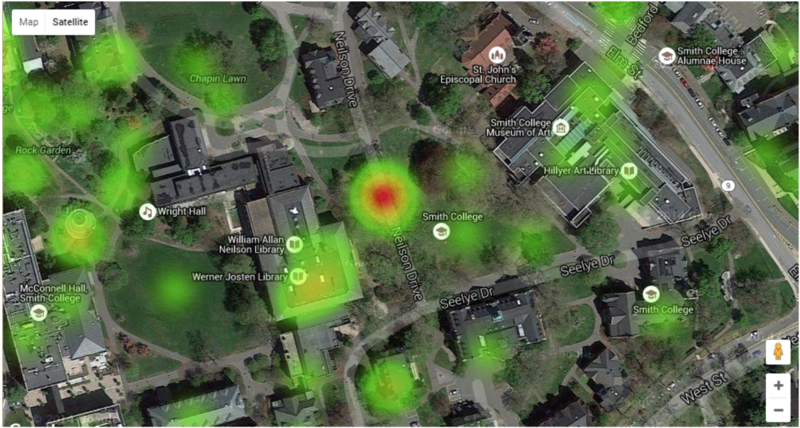 There was a clustering of favorite sites in front of Neilson,the default location. By using ArcGIS to select individual points, we realized that these spots were not really the intended locations – they were simply points left in the default locations. Going back to the Favorite Places image, the red place marker indicates where many users failed to move their favorite places. At this point, we have over 200 favorite places from users. But how do we address all the mistaken favorite places? In reflecting upon these differences, we can think about using design thinking approaches to create better web services and websites that allow maps to be more friendly and more accessible. Maps are now no longer static images on paper, but live interactive tools on the web. Design thinking embraces new ideas and tries to create and sculpt tools and projects that fit our new modern day paradigms. Just like the Design Thinking Initiative and #SmithiesDesign* programs going on on campus, we need to implement our new map insights into reality. * Learn more about Design Thinking and the Design Thinking Initiative here.